The absolute moisture meter is designed for professional use in the control output of sawmills in the input or control of pellet mills, manufacturers of heating briquettes and other branches of production. The absolute moisture meter determines the absolute humidity of sawdust and other types of biomass, such as Wood shavings, hay, straw. - For biomasses such as straw, hay, sawdust, etc. The Absolute Moisture Meter RH-2 can measure various parameters with various sensors for relative and absolute air humidity, temperature, dewpoint as well as water activity in wooden materials. The equilibrium moisture content of the thermal dewpoint calculator indicates the relative ambient humidity, which the material has an equilibrium with, and thus is unable to absorb or to emit any more humidity. The absolute humidity of this group of test instruments detects the percentage of water content based on gross weight of the material. The moisture sensor is a sensor for measuring moisture of sand consisting of a central probe surrounded by four other probes. The probes and sensor housing are made of stainless steel AISI 321. Our moisture sensor is ideally suited for installation in tanks with liquid materials such as fuel oil, sludge from cement production, fuels (CWF). For industrial continuous production of wood pellets, chips, sawdust and similar materials when in-line moisture measurement for monitoring and controlling the mixing process is important. Consistent quality of every batch, reduction of the consumption of materials, and shortest possible drying and mixing times are the criteria which are important in materials production. The PCE-MWM 210 moisture sensor of PCE Instruments helps meet those criteria through highly accurate moisture measurement. Moisture sensor for liquid materials are used in boiler installations, water-dosing and diesel oil emulsion dispersion systems. The scope of supply can include the control cabinet to operate the valves regulating water feed. The moisture sensor for liquid materials has a processing unit with RS232/RS485 interfaces. VHF-Band Moisture sensor Crushed soil, sand, stone, Gravel, Ore. The device is resistant to corrosion (stainless steel and dielectric materials) and can operate in the conditions deviating from the norm, for example, at temperatures of 250 °C. The moisture sensor probe can be mounted on the walls in the hoppers, in pipelines or on trays in conveyors. Due to pluggable design this version of the moisture sensor can also be used for soil moisture control. Designed specifically for use in humidity measurement of bulk materials, this moisture sensor is installed in bins, silos, troughs, bunkers case, distributors, augers and conveyors. Material in bulk or flowing mass, such as fibrous materials, gravel, sawdust, fly ash (mineral), wood chips (surface to 5 cm) feed grain, flour, seed, pastes, ... is continuously measurable. Suitable for determining the humidity of bulk substances, this absolute moisture sensor can be fitted into containers and systems such as troughs, bunkers, distributors, augers, conveyors, bins and silos. This permits 24/7 moisture measurement of fibrous materials, sawdust, gravel, fly ash (mineral), wood chips (surface to 5 cm) feed grain, flour, pastes, seed, or similar bulk or flowing substances. For industrial continuous production of wood pellets, chips, sawdust and similar materials when on-line moisture measurement for monitoring and controlling the drying and mixing process is important. Consistent quality of every batch, reduction of the consumption of materials, and shortest possible drying and mixing times are the criteria which are important in materials production. The PCE-MWM 300P moisture test sensor of PCE Instruments helps meet those criteria through highly accurate moisture measurement. For this data logger PCE-VDL 24I the acceleration sensor is delivered with a sampling rate of 1600 Hz. The sensor measures the acceleration, which is currently acting on it (3 axes), for example shock / vibration. The measurements take place at predetermined (selectable) time intervals. These thumb-sized Swiss Quality MSR145 test instruments record over 2 000 000 measured values - with an optional microSD card, even over a billion measured values - and are ideal for long-term measurements. It is capable of simultaneously measuring and recording a variety of measures such as temperature, humidity, pressure, 3-axis acceleration and light. All test instruments come manufacturer calibrated. ISO certification can be ordered as an option. Wireless monitoring of measurement data and rapid reading of measured values – this ease of use is offered by the new MSR145WD wireless Accelerometer. The Accelerometer is equipped with Bluetooth Low Energy, a bright OLED graphic display and the optional web-based service MSR SmartCloud for data monitoring from any location. The bestseller for transportation monitoring, fault diagnoses and load tests! The robust MSR165 Accelerometer is capable of making 1600 acceleration (shock, vibrations) measurements per second in all three axes. Shock monitoring with this Accelerometer is possible up to ±15 g or up to ±200 g, 32 measurement values are recorded even before the event takes place. The accelerometer PCE-VDL 16I from PCE Instruments measures and stores the relevant measured variables: temperature, relative humidity, air pressure, light as well as acceleration in three axes by means of a vibration sensor. Therefore, this accelerometer is ideal for monitoring vibrations on machines while simultaneously measuring and recording the relevant environmental conditions of the system. For this accelerometer PCE-VDL 24I the acceleration sensor is delivered with a sampling rate of 1600 Hz. The sensor measures the acceleration, which is currently acting on it (3 axes), for example shock / vibration. The measurements take place at predetermined (selectable) time intervals. PCE-VDR 10 is a single-axis accelerometer or vibration monitor with real-time measurement and data logging capabilities. This vibration analyzer records acceleration (m/s, g, ft/s) as well as speed (mm/s, cm/s, in/s) measurements and saves the measured data to an included SD card memory. The accelerometer PCE-VM 20 is a compact device for direct evaluation of the vibration behavior of a machine. The accelerometer can measure and display various vibration parameters, such as vibration acceleration, vibration velocity or vibration displacement. The accelerometer is used as a hand-held measuring device for the individual assessment of vibrations on machines and systems. With the help of this accelerometer, the actual state can easily be determined on site. Thus, corresponding changes can be made directly on site after the measurement. The PCE-VT 1100S accelerometer is suitable for relative measurements on various machines. With the 45 mm long needle probe, you can access hard-to-reach places in machines and motors. For this reason, this accelerometer is used for rapid measurement of imbalance and for checking bearing and gear conditions. - Needle probe: 45mm / 1.77"
PCE-VT 2700 is a factory-calibrated (certificate included) portable digital battery-powered accelerometer used to monitor the radial and axial vibration of industrial machines, equipment and parts such as bearings and gearboxes. PCE Instruments offers a wide range of stock products. However, despite an extensive selection of stock product offerings, sometimes a custom product is required to satisfy the specific requirements of a new, groundbreaking or special application. Are you looking for custom test instruments? Look no further than PCE Instruments. 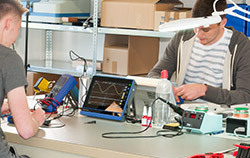 The DIN EN ISO 9001-certified PCE Product and Development Company GmbH produces customized test instruments tailored to meet the unique needs of a diverse customer base. By capitalizing on the expert knowledge and extensive experience of PCE’s industry-leading engineers and technicians to create custom-built test instruments, customers obtain measuring devices designed specifically for the task at hand. Throughout the design, development and production process, PCE's engineers and technicians work hand-in-hand with each customer to ensure the final test instrument exceeds expectations. Specifications are clearly defined from the start of the project. Sensors, microprocessors and other electronic components are sourced from high-quality suppliers. Software is written to best support the customer's systems, processes and procedures. Qualified calibration laboratories are tasked with verifying the measurement accuracy of the custom test instrument, and rigorous testing is conducted to make certain that the device will function properly under the anticipated operating conditions. If you are interested in pursuing the creation of a custom test instrument designed to accommodate an unusual or highly specialized measuring task, please contact the friendly and knowledgable staff at info@industrial-needs.com or +44 (0) 2380 987 035 for PCE Instruments UK, or at info@pce-americas.com or +1 (561) 320-9162 for PCE Americas Inc.